We are a service oriented company with over 50 years of combined experience, servicing all brands of Coin-Operated and On-Premise Laundry (OPL) equipment. 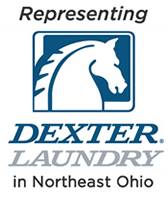 We are known as a Representative of Dexter Laundry. We can help you from replacing one unit to retooling a complete store with high efficiency equipment. I have personally owned, operated and serviced Laundromats for over 25 years. I know all the challenges that owners face. Out-of-order machines do not generate money and out-of-order machines have a negative impact on your customers. Call us and ask JOE. Let’s discuss how we can use our service experience to make your business more efficient and profitable.